Before shoveling, it is always a good idea to perform small warm up exercises i.e. squats, shoulder circles, arm and leg swings. "To avoid getting hurt, the trick is to start shoveling the places that require the least amount of strength in the beginning and gradually go for the heavier loads. If you have heavier snow to lift, you have to organize your shovelling areas to do it in the middle of your activity. The risk of getting hurt is greater at first because the body is not ready, and you are at risk at the end because you are tired, " your favorite kinesiologist would tell you. Another important tip: place the shovel handle against your chest, and use the force of your body to push the shovel along the ground, do not bend your back! 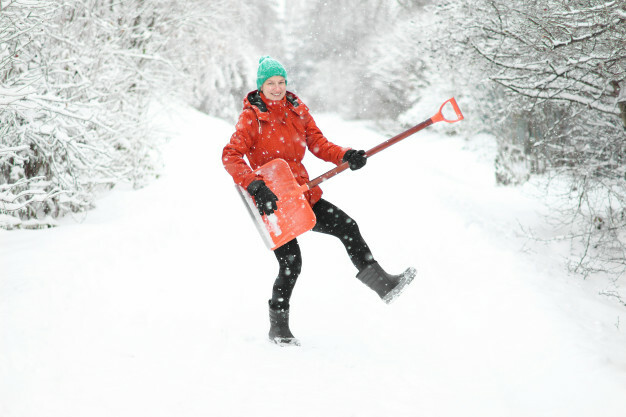 If your shovel is small, and you must lean, then take a break every minute to straighten your back, or walk around. If the snow is too heavy, ask for help! Use the right shovel, that is the right height for you, in order to shovel safely. • Warm up by walking on the spot. • Move slowly and stretch your neck, shoulders, wrists, back and legs. • Perform twenty squats (sitting motion). • Perform arm circles, leg swings, and circle your hips. • Stretch for 20 to 30 seconds and repeat them three times before and after your activity. Bend your knees if you lift snow or other heavy objects. • Change positions regularly and take breaks. • Organize smaller shoveling sessions on a day or weekend instead of doing everything all at once. • Stop the activity if you feel pain. Kinesiologists work with other health professional in an interdisciplinary approach.